I last discussed some gleanings from Torah studies regarding Jacob’s plan to meet Esau. This two-fold plan included splitting his tribe in two and preparation to send members forward with his herds and flocks “drove by drove” to impress his brother with his wealth and position. In the event the first group was massacred the other members would survive. In Chapter 32 we read that Jacob finally set forth his remaining family members. These were the ones that were dearest to him. Jacob helped them to cross the river. That night he met a man. He wrestled with this man throughout the night until the break of day. These few verses intrigue me. So I had to do a study on the subject. I came up with some differing comments and viewpoints on the subject. So I am going to let the reader ponder each and leave the decision up to you. My personal viewpoint is that Jacob was scared to death his brother would kill him and his family. Perhap scared is not an intense enough word. He was terrified and worried to the point of obsession. I believe he first sent his family, not as a test, but because if they were killed he wanted to know the outcome and claim responsibility with his own life. God had made it clear to Jacob to go back to his birth home and meet his brother. When God tells you what to do, you must do it, for God will not cause you to do something that would cause you or your family harm. And although I am sure Jacob knew this, his own human thoughts, feelings of guilt and remorse got in the way. After all he had twice deceived his brother and had gained Esau's birthright and Isaacs blessing. And though God had intervened in these matters, Jacob still felt uncomfortable with the situation. Adding to this he had just left his father-in-law, Laban, under similar circumstances. Laban attempted to cheat Jacob after promising rewards to him and would have taken back all of Jacob’s possessions had Jacob not fled in the night. 24Then Jacob was left alone, and a man wrestled with him until daybreak. 25When he saw that he had not prevailed against him, he touched the socket of his thigh; so the socket of Jacob's thigh was dislocated while he wrestled with him. 26Then he said, "Let me go, for the dawn is breaking." But he said, ")I will not let you go unless you bless me." 27So he said to him, "What is your name?" And he said, "Jacob." 28He said, "Your name shall no longer be Jacob, but Israel; for you have striven with God and with men and have prevailed." 29Then Jacob asked him and said, "Please tell me your name." But he said, "Why is it that you ask my name?" And he blessed him there. 30So Jacob named the place Peniel, for he said, "I have seen God face to face, yet my life has been preserved." 31Now the sun rose upon him just as he crossed over Penuel, and he was limping on his thigh. 32Therefore, to this day the sons of Israel do not eat the sinew of the hip which is on the socket of the thigh, because he touched the socket of Jacob's thigh in the sinew of the hip. At the beginning of the verse, Jacob is left alone. However he still has the task of taking his immediate family, two wives, two maids and eleven children and sending them on the way to the land of his father Issac where his brother Esau lived. Although this was his plan it had to be very devastating to imagine you were sending off your very family to an uncertain future. And Jacob thought the worst. For the great Rabbis that originally gave us their interpretations of scripture, crossing a body of water was a sign of a life event that would bring about change. Jacob assists his family over the fjord of the Jabbok. And though it is unsaid, he too must have crossed this water-way. In Hebraic studies of ancient civilizations there was a belief that rivers were inhabited by river demons. 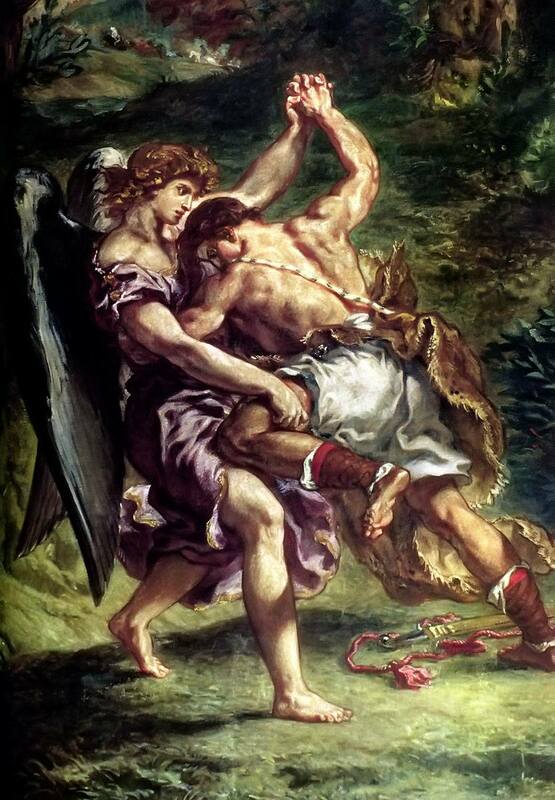 Some interrupt that Jacob believed he was being attacked by a river demon upon his return to the camp and he thought he was wrestling a demon all night until by light of dawn he realizes it is not a demon but an Angel of God. At this point he asks for God’s Blessing. The Angel asks his name. Jacob is given a new name, Israel. And the word Israel contains part of God’s own name EL. Jacob then asks the Angel his name. The Angel offers a rhetorical reply, “Why do you ask my name?” I interpret as the Angel of God saying “Do you not know you are in the presence of The Angel of The Lord God? You need not ask who I AM. You need to acknowledge and trust." The Angel did not prevail against Jacob. Despite how he is portrayed in the earlier chapters as the weaker younger brother, Jacob hardships must have transformed him into a man of great strength. 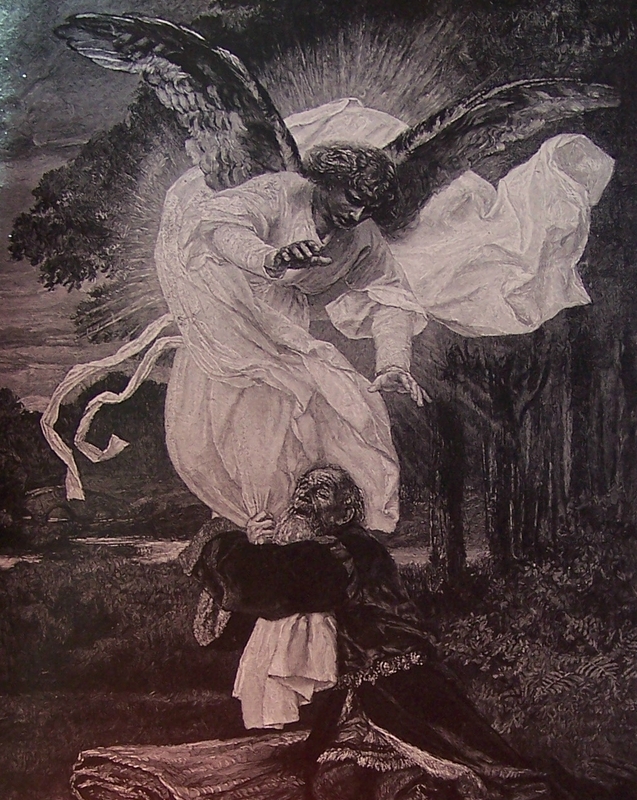 The Angel had to use supernatural power to stop the fight by dislocating Jacob’s hip.Rabbinical interpretations say this was an outward sign of the change in Jacob resulting from God’s blessing and go so far as to say that Jacob limped for the remainder of his lifetime. It is difficult for me to say, reader this is how it is, that’s my interpretation. The Bible is open to interpretation. This is the way it was meant to be and why we have so many different Hebrew and Christian groups.